Once you have perfected your pancake cooking technique, you can start experimenting with different ingredients. Try folding ricotta through the batter, as here, or caramelised eschallots. For topping, try salted caramel bananas or Nutella with the ricotta pancakes as an alternative to the strawberries. Wash the strawberries, slice them in half, place in a bowl and mix in 2 tablespoons of castor sugar. Sift the flour into a bowl and add the salt and remaining sugar. Melt the butter and pour half of it into a small bowl for greasing the pan while cooking. Mix the rest of the butter with the milk and eggs and whisk together. Make a well in the flour and pour the egg mix into the well and stir until combined and smooth. Break the ricotta into small pieces into the batter then fold in. Heat a non-stick frying pan over medium heat and brush on some of the reserved melted butter. Spoon in about 1 1/2 tablespoons of batter each for three pancakes, allowing room for them to spread. Cook for two to three minutes until bubbles form on the uncooked side. Flip the pancakes and cook for another minute. Repeat with the rest of the batter. 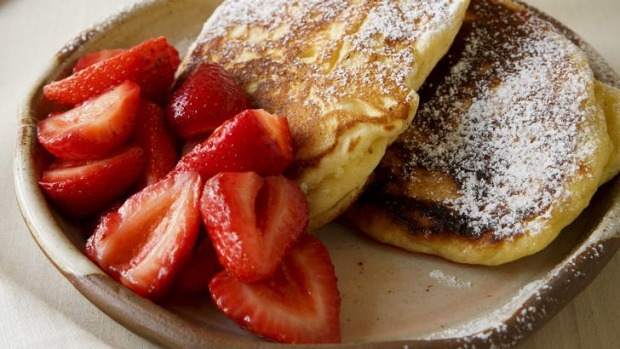 Once cooked, put a couple of pancakes on each plate then spoon some strawberries over, plus some of the juice that comes out of the strawberries. A dusting of icing sugar is optional.